On my recent holiday to Croatia, I think I ate better than on any holiday previously. Despite having NO idea about Croatia cuisine prior to the visit, I was pleasantly surprised to find that it was very similar to Italian food, with a lot of seafood added in. In this blog I’ll be covering some of the amazing places we ate in Split, before going back to Dubrovnik in a later post. Located on the road between our Airbnb and Split Old Town, we stopped in at Cukarin for breakfast on our first day in the city. 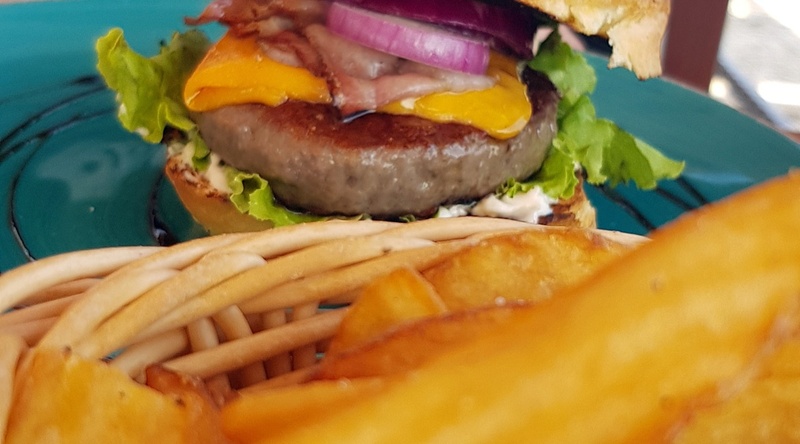 The amazingly broad menu was only in Croatian, so we had a lot of fun translating it using my Bixby Vision Translate (which was not very accurate, but was very entertaining). I chose Oreo pancakes, which were so chocolately they almost glued my mouth shut. Tim was more restrained and went for a Nutella waffle. Both were possibly a bit too filling, even if they were deliciously decadent. Luckily cappuccino is the same in Croatian! Our one dud of the trip, we chose the funky looking Bepa! for breakfast. Located in the People’s Square, the bright colours drew us in. I ordered the cheesy Omelette du Bepa, while Tim chose the Poached a la Avocado, but when they arrived we decided to swap. Unfortunately my avocado was under-seasoned and an off-putting dark green colour, while the cheese in the omelette was plasticky and underwhelming. Our fresh lemonades (mine strawberry, his ginger) were tasty but unfortunately didn’t make up for the disappointing food. After splashing out in Dubrovnik, we decided to save a bit on lunches in Split. Luckily the street food options in the city are on point. Pizza is one of the foods that Split is famous for, and there are any number of by-the-slice places where you can pick up a cheap-but-tasty bite. We went to one just outside the Iron Gate of Diocletian’s Palace, but we saw plenty of others that were almost certainly just as good. The lovely little bakery at the fair end of People’s Square (can’t remember the name, sorry!) has a range of tasty pastry products. I can completely recommend their burek, a type of filled flaky pastry. We had a large meat one each for lunch on our last day – definitely big enough for a meal! We also tried their chocolate and sour cherry varieties, and I also had a taste of their cherry and cheese strudel. I love a good beach bar! This one, despite the name, actually did a pretty awesome burger (as you may be able to tell from Tim’s face). My salad was top notch too. We had a few drinks over the course of the day – no complaints there – and the music playing from the bar was great to get us in the beach holiday mood. Are you really on holiday if you’re not stopping every five minutes for a refreshment break? As soon as we saw where Lvxor was situated, we knew it would be expensive… and with good reason. This cafe has prime position on the steps of Diocletian’s peristyle, and while there are plenty of place to perch, Lvxor’s comfy cushions are in the best patches of sun. We chose their iced coffee – in Croatia, iced coffee seems to mean coffee with ice cream in, which we were fine with on this occasion – and enjoyed people-watching around the square. While they do offer food, I recommend just splashing out on a drink here. At the end of our first full day in the city, we were in the mood for something filling. Our Airbnb hosts suggested a couple of options, and after a brief look on their website we decided to go for Galija, a pasta and pizza place in the Medieval part of Split’s Old Town. The rustic restaurant had plenty of outdoor seating, and though they could have seated us inside immediately, we opted to wait for a table out on the terrace. We decided to try both types of bruschetta on offer – traditional tomato and mozzarella, and more unusual tuna. Both were very tasty, and we had a bit of a fight over who got the third slice of tuna. Drinks wise, I’d tried an Aperol Spritz (not my cup of tea, to be honest) and Tim went for a beer, and we shared a bottle of house wine with dinner. I don’t know why anyone orders anything other than house wine in Europe tbh. For mains we both went for pasta. Tim’s choice was tagliatelle lignje i kozice, a tomatoey pasta dish with squid and prawns. And I knew what I was ordering as soon as I saw the menu: tagliatelle s prsutom i tartufima, a creamy pasta dish with prosciutto, white truffle oil and grated black truffles. Both dishes were incredibly tasty, but also very rich, so we passed on dessert and went for a stroll through Diocletian’s palace at night. On our last night in Split we tried to go to Articok, but unfortunately they didn’t have space for us when we turned up around 9pm they were completely full. No worries for us though – we ended up at the fantastic Corto Maltese, just a few minutes walk away. Although the lighting of the place left something to be desired, the atmosphere was exactly what you’d want from your last night on holiday – warm Mediterranean air, live music rolling over us, and outstanding food. We sat outside again, but the inside itself looked incredibly funky. The menu, while a little on the pricey side, was intriguing and full of character, and it took us a long time to decide what to have, despite the number of dishes being fairly limited. Skipping starters, Tim chose “Smoke on the Water” (told you it was a fun menu) – smoked risotto with seafood. He massively enjoyed it, which was good for me as I definitely didn’t want to share my freestyle pašticada, a meaty traditional stew served with fresh ravioli. As we are wont to do, we chose the house red to drink (here dubbed Priestess of R’hllor, getting that Game of Thrones reference in). Service was quite slow but we didn’t mind, letting the wine and the music distract us. Our mains were a good size but we still had plenty of room for dessert. Tim chosen a creme brulee, which was missing it’s signature bruleed top but delicious all the same. And I went for the deconstructed chocolate cake, which didn’t look particularly like a cake (though I guess that’s to be expected from the deconstructed part), and was again very tasty. Overall a top choice for our last evening in Croatia.